One Lucky Day: What's Your Favorite Color? Four lucky winners will receive a 3-pack of the new colors (our choice, but who cares they are all delicious!) 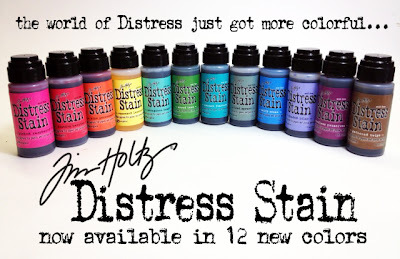 Leave a comment by midnight on Thursday and include your favorite NEW Distress Stain color. We will announce the lucky winners on Friday the 23rd. Have a great Thanksgiving....good luck! Ripe persimmon (but all are lovely)! Oh my...I'll just go with peacock feathers, but I love them all! They are all great colors but I do have to confess that Peacock Feathers is one my of favorites. Salty Ocean would have to be my favorite... but really they are all fabulous! I agree hard to pick a fav, but will probably buy peacock feathers first, then picked rasberry,then squeezed lemonade,then mowed lawn, oh the possibilities.. I'm partial to ripe persimmon. Oh such lovelies! Picked Raspberry...Peacock Feathers...Evergreen Bough...Seedless Preserves..so hard to pick just one!! But... I think my fav has to be Peacock Feathers! I'm not good a picking just one and I have an overflowing studio to prove it! Let's start with ripe persimmon though! Thanks for the chance! I can't pick favorites with these babies! I do think Iced spruce and gathered twigs would be super versatile! I'm not a purple person but the seedless preserves is one of my favorite ink colors! the salty ocean and picked raspberries are beautifully brilliant! They are all beautiful but I am drawn to Peacock Feathers so that will be my first purchase. Unless I win!!! Thanks for a chance. Lately I seem to be in a deep purple phase, so Seedless Preserves it would be... though the Ripe Persimmon also caught my eye!... Love visiting here, thanks for sharing! oooo! so hard to choose! I have used Gathered Twigs stain most recently, although the last card I did had Iced Spruce, Salty Ocean and Gathered Twigs using the ink pads... I just love color, so it is very gratifying to have 12 more choices to the original color line! If I had to choose, it would be seedless preserves. I'm just drawn to that deep purple. All of them are gorgeous! Ripe Persimmon is probably me favorite, I just love orange, but the squeezed lemondade is also just gorgeous. Hard to pick, they are all just amazing colors. I tend to gravitate toward blues so I would say salty ocean. Thanks for the chance to get some. Congrats to the lucky winners. I love peacock feathers! One of my very favorite colors :) Thanks for the chance to win! I love the Iced Spruce and seeing used in Tuesday's post. Thanks for the chance to win. Peacock feathers and picked raspberries are at the top of my list. thanks as always for sharing. I love each and every yummy color in this new palette...so hard to pick, but I think Iced Spruce is such a versatile shade that I have to pick it. Thanks for the chance to win! Happy Thanksgiving! I'm going with Ripe Persimmon. You are right though, they are all delicious! As a lover of all things purple, my favorite is Seedless Preserves! salty ocean or mowed lawn are speaking to me. They are all wonderful. Happy Thanksgiving! All the new colors are so gorgeous!! Definitely Festive Berries! Although I do admit, they are all spectacular! Thanks for the chance! I am going to choose Seedless Preserves, but they are all awesome! Would love to win some of these! Thank you for the chance! Love Peacock Feathers, thanks for the chance to win! If I could only pick one it would be .........salty ocean. It really isn't fair asking us to choose a favorite - its a bit like asking if you have a favorite child. But if you really insist that I can only choose one I think it would have to be Seedless Preserves - I only got the autumnal set a week ago so still playing with this lots. What an incredibly difficult choice, but if I had to choose, I'd pick Salty Ocean. Thanks for the giveaway! Definitly, Squeezed Lemonade ! I have all the other colors, I'm distress stain'oholic ! For me, when life gives you lemons--make Squeezed Lemonade! This bright, transparent yellow is my favorite because no other color may be as useful as this one for blending to make stronger oranges, greens and yes, even browns. I'd love to try a bottle to see, thanks Paula (and your awesome connections). ICED SPRUCE - what an awesome color. all so FAB but I think Peacock Feathers is amazing !! Oooh, how to choose one.......it would have to be Seedless Preserves for me but any of the new colours would be very welcome indeed. Love them all. Thanks for this opportunity! Peacock Feathers!! But I agree, all are yummy! Salty ocean, Suchan beautiful blue! They are all just amazing though, love these. Ripe Persimmon is my choice! I am an orange girl all the way!!!! Can't wait to see what you create with all these colors Paula! You are so talented!! I look forward to seeing and reading all about it! I also hope I win because I currently only own 4 stains and they are NOT enough!!! Happy Thanksgiving. I am off to create sunshine in my little corner of the world! Don't you just love the names....makes you want to try all the colors! Salty ocean speaks to me though if I am to pick one. Thanks Paula...have a great Thanksgiving holiday filled with great conversations and delicious food. Festive Berries or Seedless Preserves . . . or . . . It's a toss up between Peacock Feathers & Seedless Preserves. Ripe Persimmons also looks like fun! Crazy names! Hard to choose but I'll pick Seedless Preserves. What a great name. Thanks for the giveaway. I'm loving Peacock Feathers... but I have to tell you, Seedless Preserves is calling my name, too! They're all beautiful. Can't wait to see them in real life! Blues and greens are my addiction so I must say peacock feathers. It seems to be the color that I am always reaching for. I would certainly love to have it in the stain! I just was gifted the metallic stains and I have to say I love how easily they go on! Happy Thanksgiving! I am sure am thankful for all of Tim's fabulous products!! Peacock feathers - no -seedless preserves - or - mowed lawn - or ????? They are all so gorgeous! Today I have to choose Iced Spruce-perfect for a wintry tag or card! So hard to pick one... probably have to end up at Gathered Twigs - TH was right: we DID need another brown! Festive Berries...after several switching back and forth with other colors....it's the time of year for Festive Berries! :) Thank you for sharing these wonderful new colors with us AND for giving away 3 of them... Fingers crossed that this is ONE LUCKY DAY for me. Evergreen brough, peacock feathers, & Picked raspberries, & mowed lawn.....so hard just to pick one..... love them all really, have a couple on my Christmas wish list.. I like the browns, so it has to be Gathered Twigs! Oh my goodness, I can't proclaim a favorite color! Any and all would find a use in my studio!! Happy Thanksgiving to you, Paula and your families! Wishing you all a great day. And as to which is my favorite color, now that is just not fair - LOL! They all look so yummy! But if I must pick, I'll go with Peacock Feathers. My favorite color? Iced spruce, definetely! There are so many wonderful new colors! At the moment I am loving Gathered Twigs - browns are always my most used. My favorite color is Peacock Feathers, but I love them all ! So hard to choose a favorite, and I keep changing my mind, because they're all so fab. I LOVE the shade of blue of Salty Ocean, and would probably use it most often, so I'll pick that. All the colors of the new stains are gorgeous! My favorite color is Festive Berries. I'm in the holiday mood right now and love everything red. Thanks for the chance to win. I can't decide between Ripe Persimmon and Peacock Feathers! You are right - they are all DELICIOUS! These look good enough to eat! Love them all, but at this moment the Ripe Persimmon heads the list! Happy Thanksgiving and the chance to win. Ripe Persimmons has been one of my favorite colors over this Halloween/Thanksgiving season. ALL AMAZING! But I love the Salty Ocean - I'm always doing sea-inspired journal entries!! ok, salty ocean if you make me name one...even the colors on the bottles are delicious...fresh and lively and vibrant....tim holtz fever rages on! So hard to pick but I love the intense color of Squeezed Lemonade. YUMMY!! Ripe Persimmon, but i love them all! You guys have fabulous taste so I am sure what ever colors you pick for the lucky winner will be wonderful. Definitely Peacock Feathers:) thanks for a chance to win! I love purple and Seedless Perserves sounds and looks really pretty! Thank you for a chance to win some stains! I love rainbow! That would be ALL of them. I wouldn't want to pick just one. Hmm. I think I'd pick Pickled Raspberry. Oh gosh, I guess seedless preserves if I have to say just one :) Thanks for the chance to win! Yum. If I have to narrow it down ever green bough. But peacock feathers is an extremely close second. If I had to pick one it would be seedless preserves. Thanks for the chance to win. Peacock Feathers! Has to be the best colour yet. Love it! Picked Raspberry is my favorite! Thanks for the chance to win! I love Peacock Feathers, but then again, I also love Squeezed Lemonade. Together, they're gorgeous! I think they are all fabulous, I only have a small handful fo stains, so I think they are all desirable. but I will pick Ripe persimmon:) thanks for the chance to win! Peacock Feathers followed very closely by Picked Raspberry. Being a color junkie, it is like choosing your favorite dessert ... impossible! But if really threatened with either choose one or lose your eyes, I'd say Ripe Persimmon and especially if used with Seedless Preserves. Those stains are such swooners!!! thanks! love the names! would love to have some seedless preserves or shaded lilac. Peacock feathers is my favorite! Love that rich vibrant shade of teal! Hi Deb, I love the festive berry. Thanks for this opportunity. One of the hardest questions I've had to answer in a while but will have to go with Salty Ocean. The beach, summer, blue - all my faves! It is hard to pick one! I'm going to say Gathered Twiggs! I love them!! My favorite is Peacock Feathers. I love the name of it too!! I love evergreen bough. It's so nice that all the colors are now available in stains! These colors are so yummy! My favorite is Picked Raspberry although I love them all!! Thanks so much for the chance to win! Happy Thanksgiving! They really are all great colors, aren't they. Everything from the vibrant to the mellow. I truly love iced spruce, although ripe persimmon is quite nice, as s seedless preserves, and gathered twig. They really are all great though. One of my faves is Ripe Persimmon, but who doesn't just luv 'em all!!!!! I'm going to pick iced spruce. Nice cool color. pickled raspberry looks good enough to eat! Shaded Lilac... purple is the best color! Festive Berries! Reds make me happy! Festive berries look great to me! Peacock Feathers would be my pick. Ripe Persimmon, reminds me of the couple of years we lived in Korea. I love iced spruce and peacock feathers, salty ocean, too. Okay, I also love them all. How can you choose?? I would say peacock feathers is my favorite. Thanks for this chance to win! OMG, how to choose just one?!? If I have to, I guess Ripe Persimmon ... but I truly love 'em all! my favorite is Peacock Feathers. it just sounds exotic! I don't know how to pick just one. I love them all!!! I really love Picked Raspberry but then there's Peacock Feathers...a lovely teal-y color...and then there's Squeezed Lemonade...perfect for brightening up a project. This is just to hard. Ok...just one...Squeezed Lemonade. Love them all, but Gathered Twigs will be my go to all the time! Thanks! My favorite is squeezes Lemonade but I want them all! I like Gathered Twigs,mostly because I am a neutrals girl! Just the name "Picked Raspberries" makes me want some! And the color looks lush. My favorites are iced spruce and peacock feathers! Love them all but Peacock Feathers is juicy! I am SO in lobe with shaded lilac, want to use it everywhere!! PEACOCK FEATHERS would be my pick! So vibrant! Love, love, love Salty Ocean!!! I think I'm a Salty Ocean kinda girl!! It is such a fabulous color, you can't help but be happy!! wow great give away, my favorite would be salty ocean, but I agree any color would make me happy. They are all very exciting colors! I love purple so I'll have to say that Seedless Preserves is one of my favorites. Well, it's so hard to choose between Shaded Lilac and Peacock Feathers...and I also love the Seedless Preserves and Evergreen Bough. Can you tell my favorites tend to be purples and greens? So excited to have a chance to win any of these wonderful new stains. Thanks. je les adore toutes mais la couleur picked rasberry m'attire plus que les autres. Peacock Feathers for me too! Just divine! smell of fresh cut grass. Lets me know springtime is here. Happy days. Love love love those greens. Picked Raspberry, definitely a favourite for me! But its followed closely by Mowed Lawn, Peacock Feathers, Seedless Preserves, Shaded Lilac, Gathered Twigs, Salty Ocean, Ripe Persimmon, Iced Spruce and Evergreen bough, oh, and of course Squeezed Lemonade! Seedless Preserves; Because I love all things purple! :-) Thank you for this awesome give-away! I am the natural colors gal...gotta go with the Gathered Twigs first....the rest just line them up..they are all one I would use! Happy Thanksgiving to all! Talk about beauty! :) I am so into pink right now, and the Picked Raspberry ink pad is calling me! My daughter used to say she her favorite color is "all the colors of the rainbow". That will be my answer here, too. My favorite color is "all of the colors in that Distress Stain rainbow"!! All of those colors are gorgeous. But if I HAVE to pick one, I'll pick evergreen bough. Peacock feathers is my current fave. Followed by Picked Raspberry, and all the others! Who can resist "Mowed Lawn?" Makes me think of Summer, July 4th and three legged races. I love evergreen bough and peacock feathers. I would to try some of that. The seedless preserves is my favorite color. But it is hard to pick just one, they are all yummy colors! love em all, but the peacock feathers is speaking to my heart..thanks for the opportunity. I love them all, but use salty ocean is my favorite. I use the ink pad on almost everything I make lately. Oh goodness....pick just 1? Salty Ocean. Is it the name? Tim is so good at naming his babies. Is it the color? for me it is both. That salty blue is fabulous! How on earth am I ever going to pick 1.....I love them all. But if I do have to pick a fav....it would be Shaded Lilac since purple is my favourite color. Thanks for the chance to win and keeping my fingers crossed. What a great giveaway. I know I would like all the colors but i am picking Salty Ocean since I live by the Pacific. Squeezed Lemonade is second! I made your leaves and put them on Thanksgiving cards. Thanks for the lessons. Send pictures, we would love to see your cards! Wow!!! All of these colors are so intense. Ripe Persimmon and Picked Rasberry are my favorites!!! It's hard to choose because I really do like them all. Hmmm...I guess my top pick would be Salty Ocean with a VERY close second of Picked Raspberry. My favorite color is Iced Spruce! I think they are all beautiful, but my favorite has to be Salty Ocean. Blue is my favorite color and since we live by the sea it just prefect. The 3 fall colors are probably my favorite with the title going to Seedless Preserves! A close runner up though is the Peacock! I love Peacock Feathers! It's such a rich shade of turqouise. Thanks for the chance to win. Have a Happy Thanksgiving! I would have to say Peacock Feathers or Salty Ocean...the funny thing is, my mouth is watering over all the color names! Pickeled Rasberry is my fav! I really love them all though. It'll sure be One Lucky Day for whoever wins those! Peacock Feathers are calling my name... among others! I love all of them and love distress stains more all the time. I have always liked shades of turquoise/aqua so Peacock Feathers is my favorite! Happy Thanksgiving! I love all of them, but especially peacock feathers. Thank you for the chance to win some!